The Philippine eLearning Society (PeLS) has been the country’s leading organization in promoting the development of eLearning competencies through education, training and collaboration among various stakeholders in government, industry and academe. 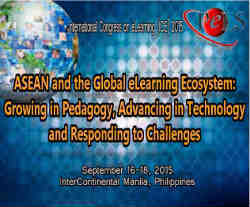 ICE 2015 theme is “ASEAN and the Global eLearning Ecosystem: Growing in Pedagogy, Advancing in Technology and Responding to Challenges"
The 2015 International Congress on eLearning (ICE 2015) of PeLS is a premier academic forum which aims to gather eLearning practitioners, educators, trainors, researchers, media specialists, instructional designers, university school administrators, policy makers, industry partners and students across the country to present and exchange new advances and research results in various aspects of eLearning as well as discuss the encountered challenges and practical adopted solutions for a successful eLearning program implementation. The Global eLearning ecosystem consists of the stakeholders (learners, teachers, developers and designers), the eLearning industry, service, content and technology providers, the government, the local and international organizations who are collaboratively working to uplift education in the 21st century way. Global eLearning is expected to continue on its path of fast and significant growth and is not showing any signs of slowing down. According to Docebo's eLearning Market Trends and Forecast for 2014-2016 report, Asia posted the highest growth rate in terms of aggregated eLearning market share at 17.3 percent compared to the worldwide e-learning market at 7.6 percent. This trend is expected to rise in the region in the light of the ASEAN integration. Explore issues, anticipate challenges and design solutions in the spirit of cooperation, collaboration and intelligent exchanges. The 2015 International Congress on eLearning (ICE 2015) will be held at the InterContinental Manila (Philippines) on September 16-18, 2015.